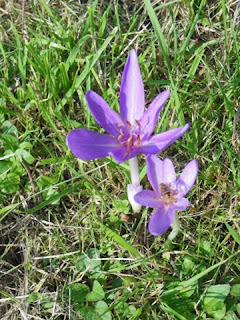 Autumn Crocus or Meadow Saffron is a native plant of the UK and is found in damp meadows and woodland clearings at this time of year. The flowers, only, appear in the Autumn when as here they push up through the grass, resembling a Crocus. The leaves appear in the springtime.